The Mighty Nein recover from their unplanned adventure in the Magic Fun Ball. Their ship has docked in the remote Besaft Isle for repairs. While exploring the city they hear rumors of war moving south across Wildemount, getting dangerously close for comfort. The Nein decide to cut their time of Besaft short and continue their search for the lost temple of Uk’otoa. Yasha joins the group later in the day, still upset that the group disappeared without a trace for so long. The rest of the group comfort her and assure her that they would never leave her behind again. Fjord leads the ship towards small island chain Uk’otoa revealed in a vision. The skies begins to darken as a wicked storm brews on the horizon. As the storm begins to whip around the ship, Yasha stands at the helm of the boat and begins to fall into a trance. She hears the Stormlord’s voice and begins to see visions of her past life in Xhorhas. A beautiful woman smiles at Yasha, then a lightning strike reveals her to be only a decomposed skeleton. A crimson demon calls Yasha “Orphanmaker” and another flash of lighting hits the deck of the ship. An elemental being of lighting rises from the ship and begins to move towards Yasha. The others on deck only see a strange ball of light moving across the deck, a phenomenal Ball Lighting. Yasha hesitates to attack, asking if the Stormlord is calling her, but the being wordlessly attacks. Yasha fights like hell to prove herself to the Stormlord. Bloodied, and battered Yasha ends the fight triumphant and proves her worth to the Stormlord. After the fight, the storm settles and Yasha visits Caduceus to try and process what she saw in her visions. She reveals why she left her clan in Xhorhas. Her tribe gave her the name Orphanmaker and a partner to marry, but she had fallen in love with another. The beautiful woman in her first vision, Zuella. They secretly married and ran away together, but the tribe found them. As punishment, Yasha was banished, and Zuella was killed. Yasha still does not know where her wife is buried, but has been collecting flowers to bring to her grave. Yasha fled into the wastelands of Xhorhas and was lost to time for weeks or months. She found herself draped at the feet of an alter to the Stormlord and found her strength once again. Caduceus and Jester comfort Yasha and the crew settle in for a night’s rest. The next morning, Fjord begins explorations for the lost temple. He has Caleb send octo-Frumpkin into the ocean to search for clues. Frumpkin begins to see signs of the sunken temple and Fjord prepares the Nein to dive the depths once again. At the ocean floor, the Nein come across a field of bloated corpses and some piscene guards at the entrance of a half sunken tower. The Nein prepare to battle their way into the last temple fo Uk’otoa. I was not prepared for the emotional gravity of this episode. Yasha’s story wrecked me. I cannot wait until Ashley can come back to the show more regularly so we can get some more amazing Yasha role playing. This was a fantastic endcap to the 2018 season! This story arc has ended up being more adventurous and exciting than I could have ever predicted. The Nein have come a long way from their circus-zombie days. It will be interesting to see where the story goes once they make it back to the Empire. It seems like war is breathing down their neck. Both Beau and Nott’s home towns could possibly be affected by the oncoming war. I have been enjoying the role playing and story telling at the table the last dozen or so episodes. The cast have really found their groove and it’s showing. Their characters are coming to life more and more each session. I’ve got to say again that Marisha and Beau have been so stand out to me this campaign. Seeing Beau grow as a character and watching Marisha really shine has been a real treat. One I would not have expected, given my dislike of her Keyleth roleplaying. Ashley has been another joy to watch. She definitely was a little rusty after being gone for so long, but the backstory this session was long awaited. Please come back soon Ashley. It’s so good to be back after a three week break! 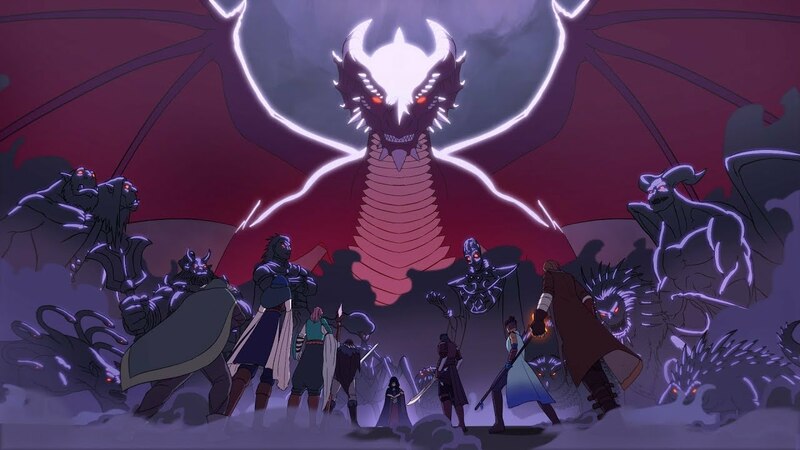 2019 only promises more exciting adventures for The Mighty Nein and Critical Role. We have a lot of new characters, new shows and new content to watch out for. Speaking of which, if you haven’t seen Liam’s Night Before Critmas One-shot….please go watch it now. I haven’t laughed this hard in ages. Travis is an absolute gem, watching Matt play a PC is always a special treat, and guest star Julie Nathanson knocks it out of the park in her first ever session. Talks Machina returned on January 8th with (almost) the entire cast joining Brian W. Foster to discuss the campaign so far. In just a few days the Critical Role Art Show will open for the public! The reception begins Friday January 18th and extends through Sunday the 20th. The Vox Machina One-shot Search for Grog will be that Saturday the 19th. Between the Sheets returns for its second season on Wednesday January 23rd! We didn’t quite get the Ashley Johnson episode yet…but it will eventually happen….eventually. Also keep and eye out for two brand new shows! Mame Drop and Pub Draw both premier next week! Check out the State of the Role update for more information on those shows. Ashley is a little rusty, but wouldn't you be to?